When it comes to fundraising, how do you make the best use of your volunteers’ time? You communicate exactly what they need to know to raise money - and no more. 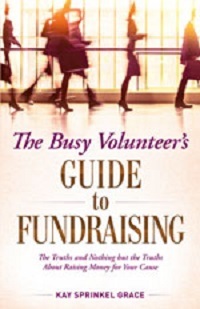 In The Busy Volunteer’s Guide to Fundraising, Kay Sprinkel Grace homes in on “the truths and nothing but the truths” about what works in fundraising and what doesn’t. Having worked with tens of thousands of volunteers for several decades, Grace knows better than to bog them down with pages and pages of theory. If you want to make the most productive use of your volunteers’ time - and motivate them to raise money efficiently – then Kay Sprinkel Grace has drawn the blueprint you need.